Let’s admit it: Smoking feels good. Each deep drag triggers pleasure receptors in the brain. Dopamine, the “happy” hormone, is released, and as a result, smokers feel “high” without the bad effects, which include drowsiness, depression, and even hallucinations. Those bad effects, however, are just superficial. What really hurts smokers the most are the hidden effects smoking has on the human body. One of these is an immediate increase in blood pressure. Why does smoking cause a rise in blood pressure? Simple. The nicotine in tobacco is absorbed by the body through the blood that flows through the lungs. The nicotine then causes the blood vessels to tighten up and narrow down, which limits the speed and amount of blood that flows throughout the body and into the internal organs. This condition causes the heart to work double-time to keep up with the body’s need for oxygenated blood. As the heart pumps faster, blood pressure also rises. Because the blood vessels are constricted, the necessary amount of oxygen in the blood is lessened. This lack of oxygen is worsened when carbon monoxide from cigarettes passes through the body and depletes the oxygen supply in the blood. This depletion, in turn, pushes the heart to work harder so that more oxygenated blood is supplied for the body’s organs to function well. But, in every issue, there are always the good part and the bad part. The good part is that this rise in blood pressure can be temporary. 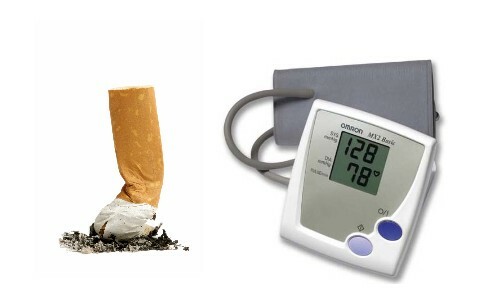 When the nicotine is taken out of the system through detoxification, blood pressure will return to normal once again. The bad part, on the other hand, is that this isn’t always the case with smoking. Smoking is habit-forming, and too many people smoke too much. Too much smoking can build up plaque inside the blood vessels. The lining is gradually filled with nicotine residue, and this narrows the passageway. It slows down blood flow to and from the heart. The damaged blood vessels won’t be able to function well, and consequently, will become worn down. As more and more nicotine is inhaled, the more plaque builds up. The blood vessels are gradually destroyed, which causes inflammation that will ultimately cause high blood pressure to develop. It also doesn’t help that the lungs, which are supposed to be the main suppliers of that much-needed oxygen, are clogged up with nicotine plaque. The plaque build-up prevents the airways from absorbing enough of the oxygen requirement for the body. To compensate, the lungs try to take in more air. This is the reason why smokers breathe deeper and faster than non-smokers do. In the end, this constant struggle for sufficient oxygen in the blood can cause internal organs to break down. The lungs are clogged up with nicotine and phlegm, and the heart is worn down from too much pumping. The smoker is left with nothing, but diseases such as coronary heart disease, emphysema, and cancer of the lungs.